Margaret Atwood. Murder in the Dark. A Reader's Companion and Study Guide. "A leathery bog-man transforms an old love affair; a sweet, gruesome gift is sent by the wife of an ex-lover; landscape paintings are haunted by the ghost of a young girl. 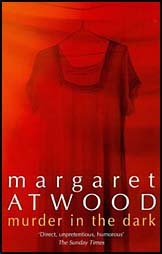 This dazzling collection of 10 short stories takes us into familiar Atwood territory to reveal the logic of irrational behaviour and the many textures lying beneath ordinary life. These short fictons and prose poems are bizarre: bread can no longer be conceived as wholesome comforting loaves and a poisonous brew is concocted by cynical five-year-olds. Intent on breaking the forces of convention, this collection should captivate the reader's imagination." —The Publisher. "The Boys' Own Annual, 1911"